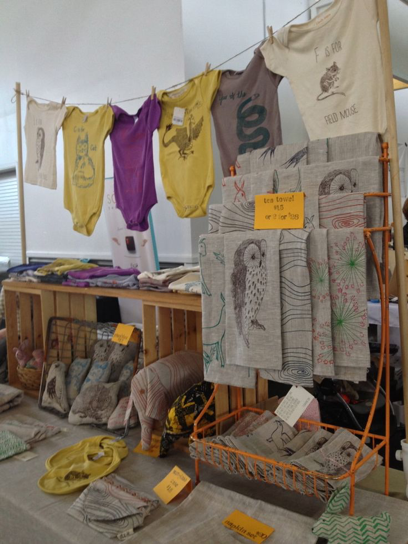 You need your craft booth and craft fair display to reflect your talent as an artist, the value of your product, and the aesthetic of your brand. 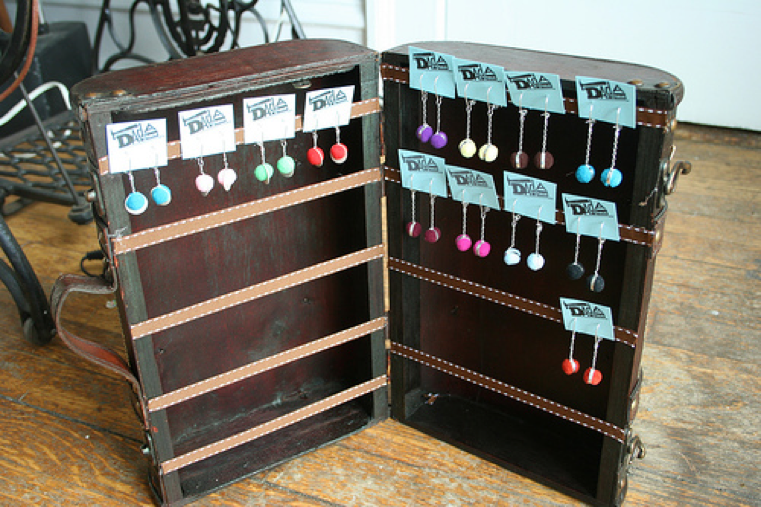 But hauling around a whole bunch of product and stylish ways to table display it isn’t easy. So why go to all the trouble? 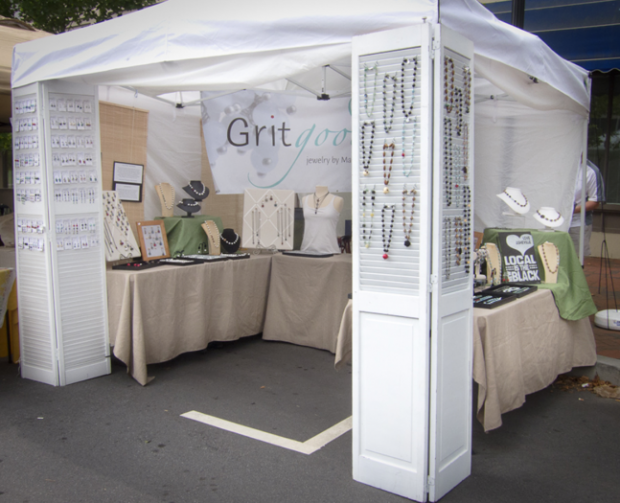 Join Nicole Stevenson in “Secrets of Selling at Craft Fairs: How to Get In, Make Sales, and Grow Your Business” and WATCH NOW! 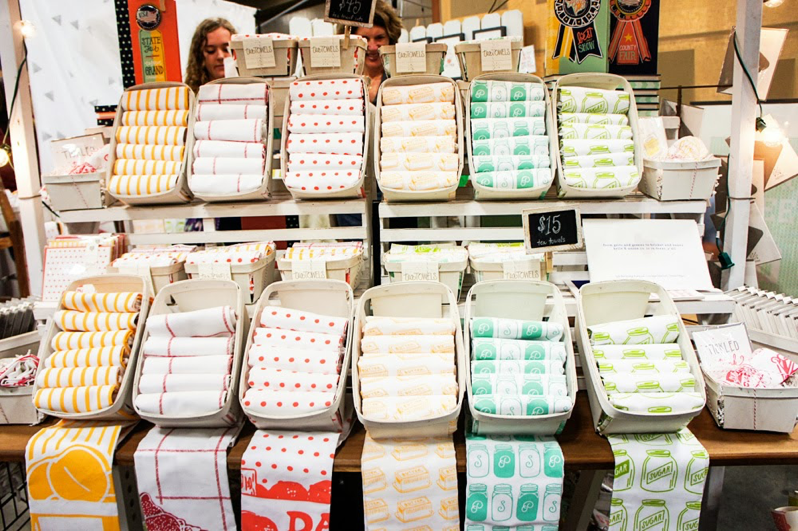 Because craft shows are about more than the total of your sales receipts. 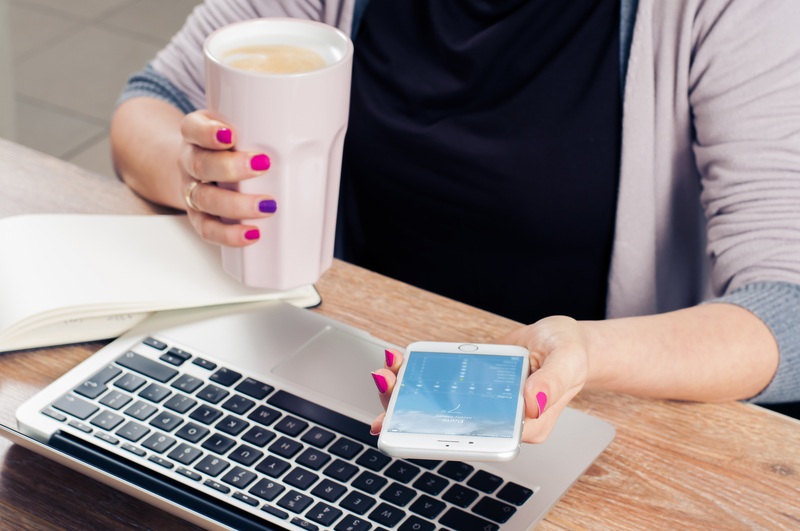 Discover how to market what you make with Megan Auman. Learn more. With so much on the line, it is important to get your booth design, table, displays or display stands, and overall space right. To help you prepare and get inspired, we pulled together an inspiring collection of craft show display ideas and craft show tips that will help you discover ways to stand out from the crowd. 1. A dark wall contrasts the bright colors on the prints, all held up by simple binder clips to hold it up. 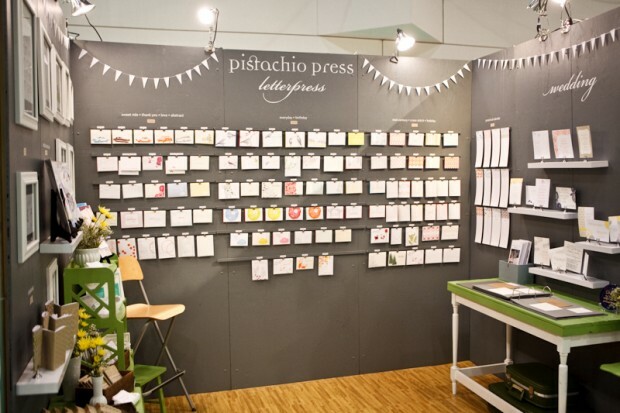 The Pistachio Press display (as photographed by Oh So Beautiful Paper) is simple, yet impactful. 2. 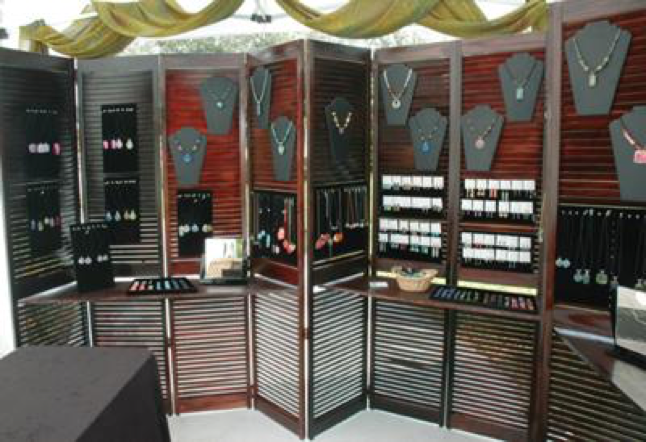 Way back in 2007 a Richmond Craft Mafia maker used a little ribbon and a whole lot of vision to transform an old trunk into a display booth. 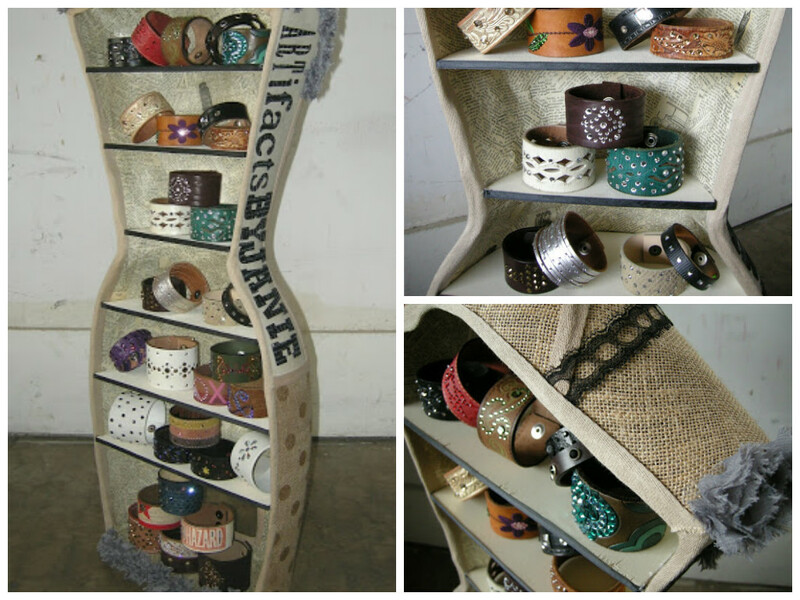 Not only is it an eye-catching product display and jewelry stand, it can store and transport products. 3. Pallets can be found on places like Craiglist, Amazon or Etsy at a very low cost (and if you look hard enough you may even find them for free). 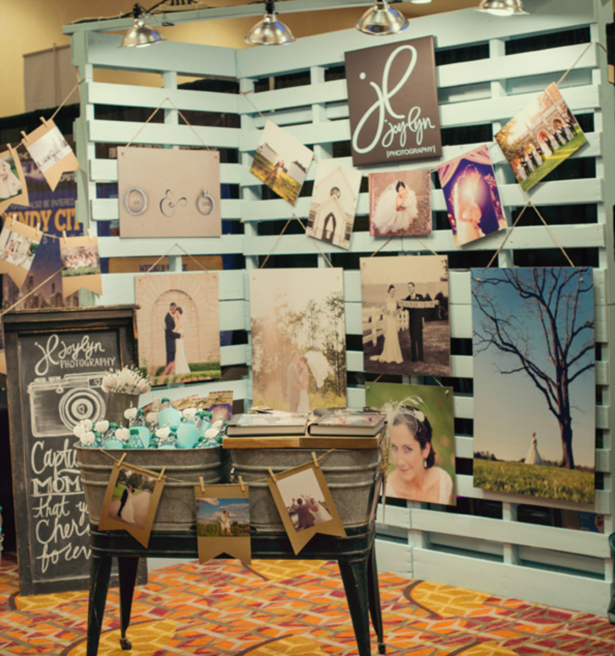 Take inspiration from Joy Lyn Photography and create a beautiful retail display out of pallets to hang your handmade goodies at your next craft show. 4. 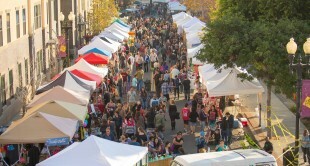 Displaying crafts at outdoor craft fairs or festivals means you will probably have a canopy. Try this clever trick from Grit Goods to hide those unattractive canopy poles, while creating an inviting display for your items. 5. 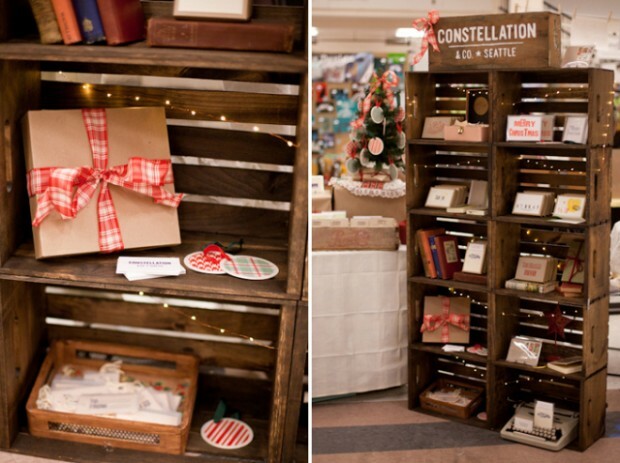 If you want to incorporate craft show display shelves into your booth design, try this easy apple crate shelf. 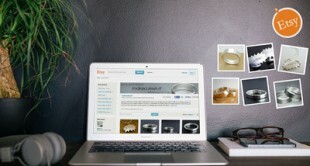 Constellation and Co. offers up an excellent DIY shelving units tutorial that’ll show you how it is done. 6. WiredOrchid repurposed shutter doors for a freestanding wall display. You can remove some of the shutters to create shelving units for items that cannot be hung. 8. Janie Severin, of ARTifcatsBYJANIE, repurposed a mannequin by adding horizontal shelving units to create a very cool bracelet and necklace display. 9. 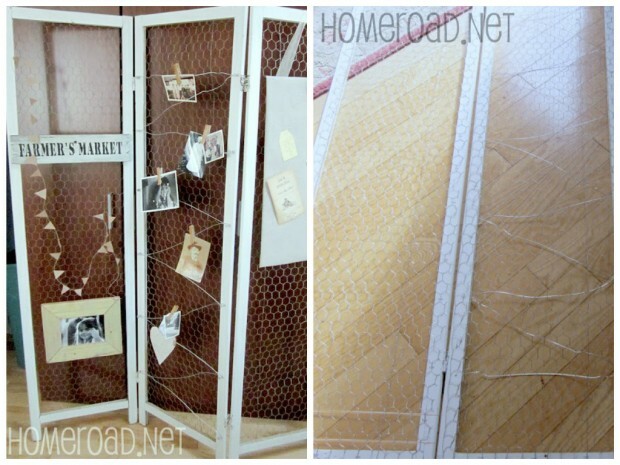 A vertical display can also be made from chicken wire and an old screen like Homeroad did for their at-home photo display. Chicken wire is relatively lightweight which makes it nice and easy to transport and display products. 10. 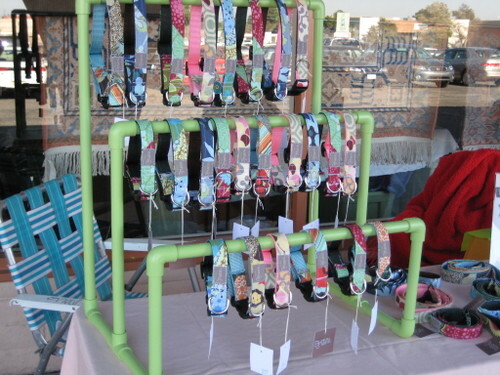 Customize a hanging display by using PVC pipe and ends from the hardware store like Mimi Green did for her dog collars. There are so many potential configurations the possibilities are endless! 11. If you have a lot of different items to display use baskets, like Belle and Union did, to organize each item making them more accessible and organized. 12. 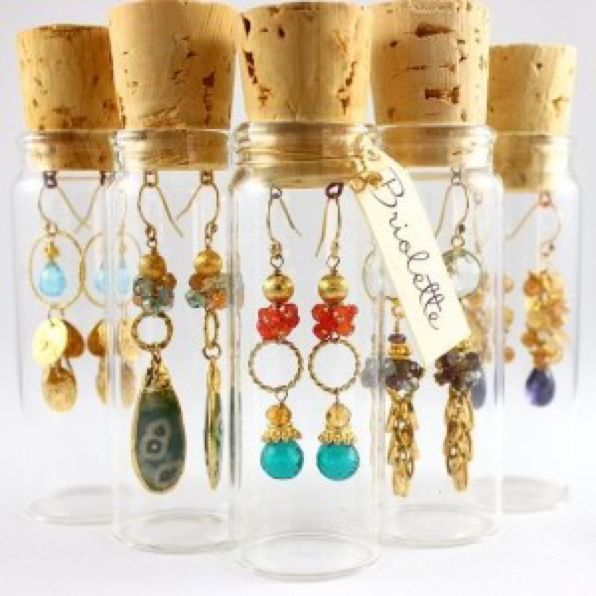 A fun way to show off jewelry displays is the Briolette way: in a corked bottle. Not only does this make a great market display, it also serves as perfect packaging. 13. 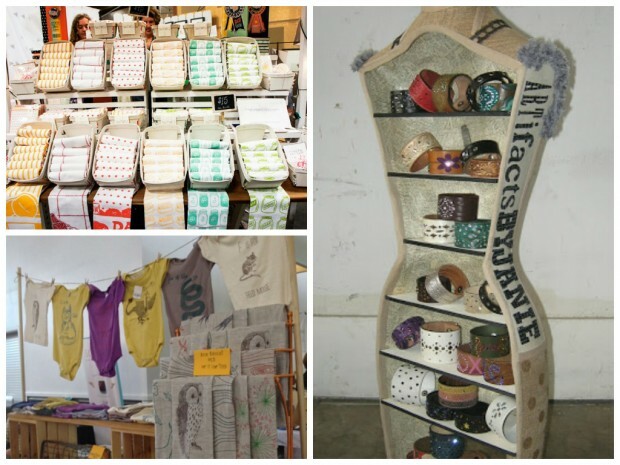 There are so many creative ways to upcycle existing objects into creative craft displays and newspapers are no exception. 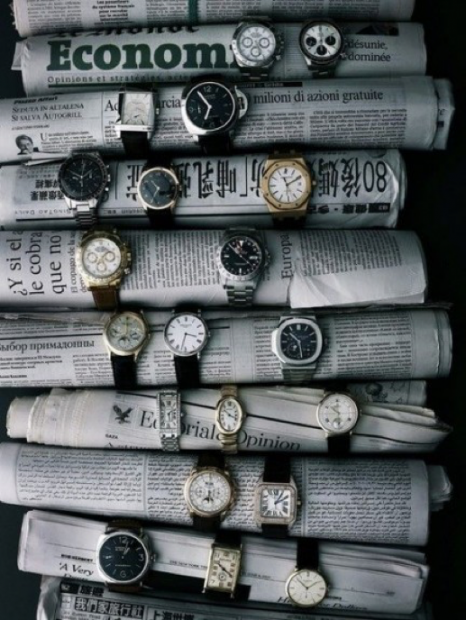 Here Retail Details rolled up old newspaper for a watch display that could work just as well for bracelet display or create wider rolls of newspaper for necklace displays. With the help of the internet and more than a few trips to the craft supply store, Lisa has made everything from shark-themed wall art to fondant draped wedding cakes. Her current hobby involves cat costumes.